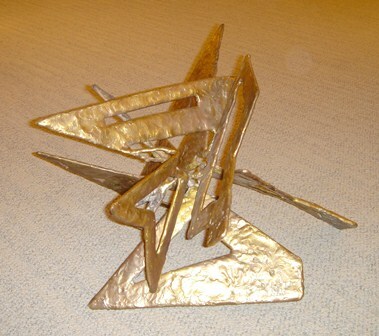 Lassaw is one of the great abstract expressionist sculptors from the 1930's. 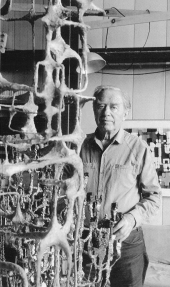 His chosen medium by the 1950's was in welded alloys depicting his thoughts on the universe from the tiniest of atoms to the largest of solar systems. Not only was he an important member of the American Abstract Artists group formed in 1935, but was one of the few who also linked up with the New York school of Abstract Expressionists in the early 1950's. Therefore he was not only a close friend of Balcomb Greene and Byron Browne, but also of Willem de Kooning. During the Whitney Museum of American Art's tribute to the 20th century called "An American Century", Lassaw was included in both pre and post 1950 sections of this millennium two part exhibition. He has been represented by the Harmon-Meek Gallery since 1982 and has had three solo exhibitions of which one centered on his "sculpture to wear" of which fewer than ten remain available to date. Lassaw has works in the permanent collections of MOMA, Whitney, Carnegie, Balto.MA, MOMA-Rio de Janeiro, Bezalel Mus-Israel, Peggy Guggenheim's "Art of the Century"-Venice,Italy, Newark, UCLA, Albright-Know,Wichita,Fogg (Harvard), Worcester and ten others.